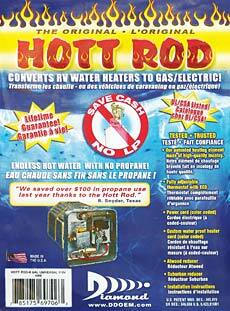 Hott Rod® products are warranted by Diamond Group to the original purchaser, for as long as that purchaser owns the RV on which the Hott Rod® was installed. This warranty does not include labor charges or damages resulting from accident, misuse, improper installation, abuse, or lack of reasonable care. Diamond Group suggests cleaning the heater element on a regular basis. Instructions for cleaning are located under “Maintenance” in your Installation Instructions. Refer to Installation Instructions for complete warranty details and coverage. Send only the part which is defective. Complete kits will not be sent as a replacement. A Warranty Card must be submitted and on file with Diamond Group to obtain warranty. If you do not have a Warranty Card on file, you must include a Proof-of-Purchase Receipt – NO EXCEPTIONS! The warranty is valid for the original purchaser and is NOT transferable. Include a check or money order (*Outside the US – Customers must submit a US Dollars Money Order ONLY) in the amount of $9.00 for warranty processing and shipping charges. Completed Warranty Claim Form. Prompt disposition: Diamond Group will make a good faith effort for prompt correction to any Hott Rod® that proves to be defective within warranty limitations.